Progressive Rock is a musical genre that is a brother of Metal in many ways. But different from his brother, after the 70s, Progressive Rock became a cult musical genre, and only a few names survived (the famous ones, to be honest). But it doesn’t mean that new bands can’t appear and do a good work, or veterans bands of the genre that aren’t as known as YES or KING CRIMSON can’t release new albums. 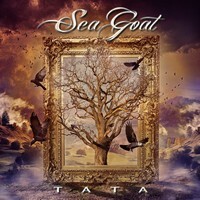 On the last case is the German band SEA GOAT that released their latest album, “Tata”. They have the same influences of the past, creating a tender and introspective form of music (and it has a very charming energy as well). But differently from many bands, they made an update on their music: the songs are not as long and technical as the traditional insight of the genre, and it’s more accessible to a broader public. But their musical work is really very good, and obviously, it is elegant and refined as Progressive Rock is about, and has very charming melodies. On the sound quality is where you feel the difference between their work and those bands from the past: they prefer a clear insight on the production, but with a modern outfit that define the instrumental tunes. For some purist fans of Progressive Rock, it would be a sin, but in the case of SEA GOAT, it is truly fine. The way the make music reminds a lot the way MARILLION does, but without being a copy. As their best moments, you can hear the introspective melodies of “Book of Liberty”, the beautiful and expressive “Morning Glory” with its fine guitars, the noir scent of “Friends”, the influence of Electronic Pop Rock from the 80s that arise on “Water Pictures”, and the melodic “You’ll Never Know” with its Folk influences. Althuogh it can be hard to some to understand and assimilate what they play, I believe that a second listening on “Tata” will make you like it.